Reading and share top 65 famous quotes and sayings about Divine Nature by famous authors and people. 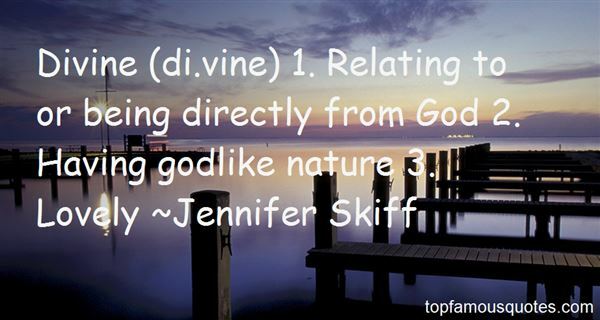 Browse top 65 famous quotes and sayings about Divine Nature by most favorite authors. 1. "Today a new faith is stirring: the myth of blood, the faith that along with blood we are defending the divine nature of man as a whole." 2. "This is an organic religion. A religion of the people from heart to heart; a faith that finds the presence of the Divine within life, and nature, and ourselves. We don't have teachers and books because we are our own teachers, and our book is the sacred book of the Earth. We believe that we can connect with the God and Goddess and hear their voices, receive their inspiration directly and take responsibility for our own actions, without the intermediary of a pope or rabbi. We have a loose set of beliefs and morals and a ritual structure that is common to all Wiccans, but there is room for creativity and deep mystical experiences. This is a faith with roots as old as the earth. --Meri Fowler"
3. "Art is contemplation. It is the pleasure of the mind which searches into nature and which there divines the spirit of which nature herself is animated." 4. "The source of man's rights is not divine law or a congressional law, but the law of identity. A is A ___ and man is man. Rights are conditions of existence required by man's nature for his proper survival. If man is to live on earth, it is right for him to use his mind, it is right to act on his own free judgment, it is right to work for his values and to keep the product for his work. If life on earth is his purpose, he has a right to live as a rational being: nature forbids him the irrational"
5. "He has given us very great and precious promises, so that through them you may share in the divine nature. 2 Peter 1:4"
6. "Live in the wisdom of accepted tenderness. Tenderness awakens within the security of knowing we are thoroughly and sincerely liked by someone...Scripture suggests that the essence of the divine nature is compassion and that the heart of God is defined by tenderness." 7. "The Divine Nature wounds and perhaps destroys us merely by being what it is." 8. "Pagan paths, of which there are many, more often than not, are based upon an acknowledgement of a Divine presence within nature, as acknowledged by the pre-Christian peoples of these Islands and Northern Europe more than 1500 years ago." 9. "It is a doctrine, as I believe, taught us in Holy Writ, that when a man is saved by divine grace, he is not wholly cleansed from the corruption of his heart. When we believe in Jesus Christ all our sins are pardoned; yet the power of sin, albeit that it is weakened and kept under by the dominion of the new-born nature which God doth infuse into our souls, doth not cease, but still tarrieth in us, and will do so to our dying day. "C.H Spurgeon"
10. "And as for the vague something --- was it a sinister or a sorrowful, a designing or a desponding expression? --- that opened upon a careful observer, now and then, in his eye, and closed again before one could fathom the strange depth partially disclosed; that something which used to make me fear and shrink, as if I had been wandering amongst volcanic-looking hills, and had suddenly felt the ground quiver, and seen it gape: that something, I, at intervals, beheld still; and with throbbing heart, but not with palsied nerves. Instead of wishing to shun, I longed only to dare --- to divine it; and I thought Miss Ingram happy, because one day she might look into the abyss at her leisure, explore its secrets and analyse their nature." 11. "But in the divine nature Persons three,And in one person the divine and human." 12. "Man's responsibility is correspondingly operative with his free agency. Actions in harmony with divine law and the laws of nature will bring happiness, and those in opposition to divine truth, misery. Man is responsible not only for every deed, but also for every idle word and thought." 13. "But God does not neglect his lost creature. He plans to re-create his image in man, to recover his first delight in his handiwork. He is seeking in it his own image so that he may love it. But there is only one way to achieve this purpose and that is for God, out of sheer mercy, to assume the image and form of fallen man. But this restoration of the divine image concerns not just a part, but the whole image of divine nature. It is not enough for man to simply recover right ideas about God, or to obey his will in the isolated actions of his life. No, man must be re-fashioned as a living whole in the image of God. His whole form, body, soul and spirit, must once more bear that image on earth. Such is God's purpose and destiny for man. His good pleasure can rest only on his perfected image." 14. "If in this life only we have hope....." By God, that was true, too. This quickening divine power that he had experienced could not be confined to this world, for cruel, sordid, ugly, devilish can be this world, and by the nature of things that power could have neither source nor ending in it; only flow through it, around it, over it, under it, gathering up the gold into its eternal shining and burning the dross in its fire." 15. "The nearer Christ comes to a heart, the more it becomes conscious of its guilt; it will then either ask for his mercy and find peace, or else it will turn against Him because it is not yet ready to give up its sinfulness. Thus He will separate the good from the bad, the wheat from the chaff. Man's reaction to this Divine Presence will be the test: either it will call out all the opposition of egotistic natures, or else galvanize them into a regeneration and a resurrection." 16. "If the moderns really want a simple religion of love, they must look for it in the Athanasian Creed. The truth is that the trumpet of true Christianity, the challenge of the charities and simplicities of Bethlehem or Christmas Day never rang out more arrestingly and unmistakably than in the defiance of Athanasius to the cold compromise of the Arians. It was emphatically he who really was fighting for a God of Love against a God of colourless and remote cosmic control; the God of the stoics and the agnostics. It was emphatically he who was fighting for the Holy Child against the grey deity of the Pharisees and the Sadducees. He was fighting for that very balance of beautiful interdependence and intimacy, in the very Trinity of the Divine Nature, that draws our hearts to the Trinity of the Holy Family. His dogma, if the phrase be not misunderstood, turns even God into a Holy Family." 17. "To cease to wonder is to fall plumb-down from the childlike to the commonplace—the most undivine of all moods intellectual. Our nature can never be at home among things that are not wonderful to us." 18. "The chief difficulty which prevents men of science from believing in divine as well as in nature Spirits is their materialism." 19. "Love is the divine Mother's arms; when those arms are spread, every soul falls into them.The Sufis of all ages have been known for their beautiful personality. It does not mean that among them there have not been people with great powers, wonderful powers and wisdom. But beyond all that, what is most known of the Sufis is the human side of their nature: that tact which attuned them to wise and foolish, to poor and rich, to strong and weak -- to all. They met everyone on his own plane, they spoke to everyone in his own language. What did Jesus teach when he said to the fishermen, 'Come hither, I will make you fishers of men?' It did not mean, 'I will teach you ways by which you get the best of man.' It only meant: your tact, your sympathy will spread its arms before every soul who comes, as mother's arms are spread out for her little ones." 20. "He read the veinings of a leaf, the pattern on a mushroom cap, and divined mysteries, relations, futures, possibilities: the magic of symbols, the foreshadowing of numbers and writing, the reduction of infinitudes and multiplicities to simplicity, to system, to concept. For all these ways of comprehending the world through the mind no doubt lay within him, nameless, unnamed, but not inconceivable, not beyond the bounds of presentiment, still in the germ, but essential to his nature, part of him, growing organically within him. And if we were to go still further back beyond this Rainmaker and his time which to us seems so early and primitive, if we were to go several thousand years further back into the past, wherever we found man we would still find - this is our firm belief - the mind of man, that mind which has no beginning and always has contained everything that it later produces." 21. "Conscience, the divine nature within us, sees everything as connected, what's good for all is always its priority." 22. "It's tempting to tether ourselves to the familiar comfort of the way things are, but fulfillment is often discovered in the unpredictable and unknown. We can serve ourselves and our universe, best, when we can take the journey that takes us from the limited desire of our ego, to the ever-expanding love and wisdom, of our divine nature." 23. "When Charles Darwin published On the Origin of Species in 1859, he exposed the world to a momentous discovery . For the first time in history, human beings were seen not as creatures of divine origin, but instead, as a product of nature, an animal like every other on the planet. Imagine yourself back in that amazing year. The day before Darwin's book was published, you wake up thinking yourself the image of God; the next morning you realize you have the face of a monkey. Not everybody immediately embraced this rude demotion from god to goat." 24. "Divine (di.vine) 1. Relating to or being directly from God 2. Having godlike nature 3. Lovely"
25. "Away thou fondling motley humorist, Leave mee, and in this standing woodden chest, Consorted with these few bookes, let me lye In prison, and here be coffin'd, when I dye; Here are Gods conduits, grave Divines; and here Natures Secretary, the Philosopher; And jolly Statesmen, which teach how to tie The sinewes of a cities mistique bodie; Here gathering Chroniclers, and by them stand Giddie fantastique Poets of each land. Shall I leave all this constant company, And follow headlong, wild uncertaine thee?" 26. "Clearly the Holy Spirit is not merely a quality to be found in the divine nature … He is a holy intelligent person." 27. "But of that day and hour no one knows neither the angels in heaven nor the Son but only the Father.' We are not to think that the Son of God as he is God did not know the day or hour but only that his human nature did not know it because his divine nature had not chosen to reveal it to his human nature." 28. "However, as the Eastern churches have always maintained, through Christ creation is intended eventually to share in the life of God, the life of divine nature." 29. "By salvation I mean not barely according to the vulgar notion deliverance from hell or going to heaven but a present deliverance from sin a restoration of the soul to its primitive health its original purity a recovery of the divine nature the renewal of our souls after the image of God in righteousness and true holiness in justice mercy and truth." 30. "War is thus divine in itself, since it is a law of the world. War is divine through its consequences of a supernatural nature which are as much general as particular. War is divine in the mysterious glory that surrounds it and in the no less inexplicable attraction that draws us to it. War is divine by the manner in which it breaks out." 31. "The civil law, as well as nature herself, has always recognized a wide difference in the respective spheres and destinies of man and woman. Man is, or should be, woman's protector and defender...The constitution of the family organization, which is founded in the divine ordinance, as well as in the nature of things, indicates the domestic sphere as that which properly belongs to the domain and functions of womanhood. The harmony, not to say identity, of interests and views which belong, or should belong, to the family institution is repugnant to the idea of a woman adopting a distinct and independent career from that of her husband...The paramount destiny and mission of women are to fulfil the noble and benign offices of wife and mother. This is the law of the Creator. 1872"
32. "How may paintings have preserved the image of a divine beauty which in its natural manifestation has been rapidly overtaken by time or death. Thus, the work of the painter is nobler than that of nature, its mistress." 33. "That love, which is the highest joy, which is divine simplicity itself, is not for you moderns, you children of reflection. It works only evil in you. As soon as you wish to be natural, you becomecommon. To you nature seems something hostile; you have made devils out of the smiling gods of Greece, and out of me a demon. You can only exorcise and curse me, or slay yourselves in bacchantic madness before my altar. And if ever one of you has had the courage to kiss my red mouth, he makes a barefoot pilgrimage to Rome in penitential robes and expects flowers to grow from his withered staff, while under my feet roses, violets, and myrtles spring up every hour, but their fragrance does not agree with you. Stay among your northern fogs and Christian incense; let us pagans remain under the debris, beneath the lava; do not disinter us." 34. "Divine Nature gave the fields, human art built the cities." 35. "We do not teach and practice community of goods but we teach and testify the Word of the Lord, that all true believers in Christ are of one body (I Cor. 12:13), partakers of one bread (I Cor. 10:17), have one God and one Lord (Eph. 4). Seeing then that they are one, . . . it is Christian and reasonable that they also have divine love among them and that one member cares for another, for both the Scriptures and nature teach this. They show mercy and love, as much as is in them. They do not suffer a beggar among them. They have pity on the wants of the saints. They receive the wretched. They take strangers into their houses. They comfort the sad. They lend to the needy. They clothe the naked. They share their bread with the hungry. They do not turn their face from the poor nor do they regard their decrepit limbs and flesh (Isa. 58). This is the kind of brotherhood we teach." 36. "On the hill opposite, Joachim tolled the midday bell, announcing lunch to the workers in the fields. Klaus listened a moment, then said, "I thought it would be a bleaker scene. "Dietrich turned to him, "What would be? ""This day. I thought it would be marked by terrible signs - lowering clouds, ominous winds, a crack of thunder. Twilight. Yet, it is so ordinary a morning that I grow frightened. ""Only now frightened.""Ja. Portents would mean a Divine Mover, however mysterious His moves; and the wrath of an angry God may be turned away by prayer and penance. But it simply happened. Everard grew sick and fell down. There were no signs; so it may be a natural thing, as you have always said. And against nature, we have no recourse." 37. 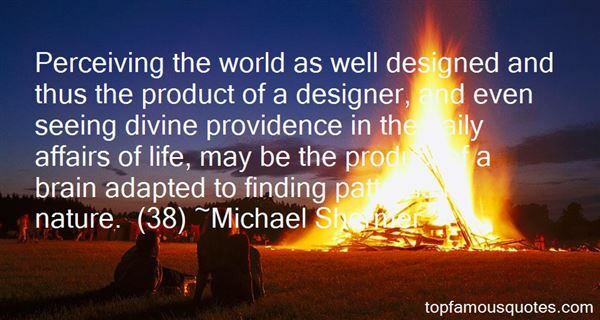 "Perceiving the world as well designed and thus the product of a designer, and even seeing divine providence in the daily affairs of life, may be the product of a brain adapted to finding patterns in nature. (38)"
38. "Comprenez-moi. Le misogyne ne méprise pas les femmes. Le misogyne n'aime pas la féminité. Les hommes se répartissent depuis toujours en deux grandes catégories. Les adorateurs des femmes, autrement dit les poètes, et les misogynes ou, pour mieux dire, les gynophobes. Les adorateurs ou poètes vénèrent les valeurs féminines traditionelles comme le sentiment, le foyer, la maternité, la fécondité, les éclairs sacrés de l'hysterie, et la voix divine de la nature en nous, tandis qu'aux misogynes ou gynophobes ces valeurs inspirent un léger effroi. Chez la femme, l'adorateur vénère la féminité, alors que le misogyne donne toujours la préférence à la femme sur la féminité. N'oubliez pas une chose: une femme ne peut être vraiment heureuse qu'avec un misogyne." 39. "Because misogynists are the best of men." All the poets reacted to these words with hooting. Boccaccio was forced to raise his voice: "Please understand me. Misogynists don't despise women. Misogynists don't like femininity. Men have always been divided into two categories. Worshipers of women, otherwise known as poets, and misogynists, or, more accurately, gynophobes. Worshipers or poets revere traditional feminine values such as feelings, the home, motherhood, fertility, sacred flashes of hysteria, and the divine voice of nature within us, while in misogynists or gynophobes these values inspire a touch of terror. Worshipers revere women's femininity, while misogynists always prefer women to femininity. Don't forget: a woman can be happy only with a misogynist. No woman has ever been happy with any of you!" 40. 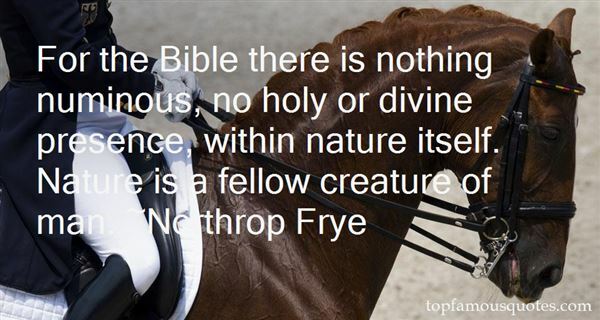 "For the Bible there is nothing numinous, no holy or divine presence, within nature itself. Nature is a fellow creature of man." 41. "I mean, if a person acts irresponsibly in his own life, he will pay the consequences. And it's not so much divine retribution as it's built into the law of nature." 42. "He himself, he realized, had always been most abominably frightened, even at the height of his divine power, a frail god upon a rickety throne, afraid of opening letters, of making decisions, afraid of the instinctive knowledge in the eyes of mules, of the innocent eyes of good men, of the elastic nature of the passions, even of the devotion he had received from some men, and one woman, and dogs." 43. "Here the contention is not just that the new Darwinian paradigm can help us realize whichever moral values we happen to choose. The claim is that the new paradigm can actually influence — legitimately — our choice of basic values in the first place. Some Darwinians insist that such influence can never be legitimate. What they have in mind is the naturalistic fallacy, whose past violation has so tainted their line of work. But what we're doing here doesn't violate the naturalistic fallacy. Quite the opposite. By studying nature — by seeing the origins of the retributive impulse — we see how we have been conned into committing the naturalistic fallacy without knowing it; we discover that the aura of divine truth surrounding retribution is nothing more than a tool with which nature — natural selection — gets us to uncritically accept its "values." Once this revelation hits norm, we are less likely to obey this aura, and thus less likely to commit the fallacy." 44. "We glorify the Holy Ghost together with the Father and the Son, from the conviction that He is not separated from the Divine Nature; for that which is foreign by nature does not share in the same honors." 45. "If a man can realize his divine nature with the help of an image, would it be right to call that a sin? Nor, even when he has passed that stage, should he call it an error. [...] man is not traveling from error to truth, but from truth to truth, from lower to higher truth. To him all the religions from the lowest fetishism to the highest absolutism, mean so many attempts of the human soul to grasp and realize the Infinite, each determined by the conditions of its birth and association, and each of these marks a stage of progress; and every soul is a young eagle soaring higher and higher, gathering more and more strength till it reaches the Glorious Sun." 46. "Machinations are divined. Response is by nature, nurture, experience and if sought peer pressure. You are the owner of free will. Choose." 47. "So long as there shall exist, by virtue of law and custom, decrees of damnation pronounced by society, artificially creating hells amid the civilization of earth, and adding the element of human fate to divine destiny; so long as the three great problems of the century—the degradation of man through pauperism, the corruption of woman through hunger, the crippling of children through lack of light—are unsolved; so long as social asphyxia is possible in any part of the world;—in other words, and with a still wider significance, so long as ignorance and poverty exist on earth, books of the nature of Les Misérables cannot fail to be of use. HAUTEVILLE HOUSE, 1862. [Translation by Isabel F. Hapgood]"
48. "If love could force my own thoughts over the edge of the world and out of time, then could I not see how even divine omnipotence might by the force of its own love be swayed down to the world? ...how it might, because it could know its own creatures only by compassion, put on mortal flesh, become a man, and walk among us, assume our nature and our fate, suffer our faults and our death?" 49. "In the exercise of God's efficiency, the decree of God comes first. This manner of working is the most perfect of all and notably agrees with the divine nature." 50. "Faith is not a notion, but a real strong essential hunger, an attracting or magnetic desire of Christ, which as it proceeds from a seed of the divine nature in us, so it attracts and unites with its like." I don't know who Little Richard is."